This is a seriously fun and seriously easy science experiment for kids to set up this holiday season. We all need a few tricks up our sleeve with all the hustle and bustle that is going on. 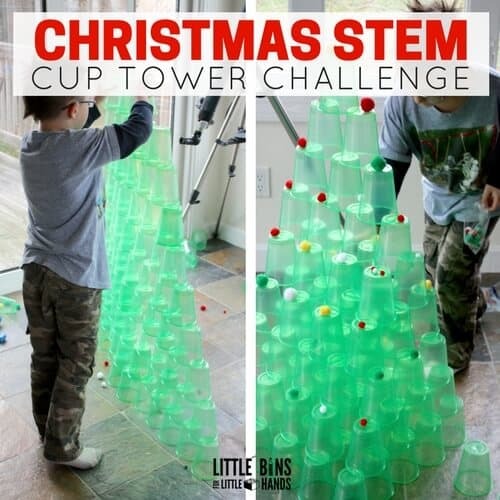 Get your kids off their screens and into this Christmas cup tower STEM challenge which is part of our 25 Days of Christmas STEM countdown. Next time you’re at the store grab a couple packs of party cups and reuse them all year long. 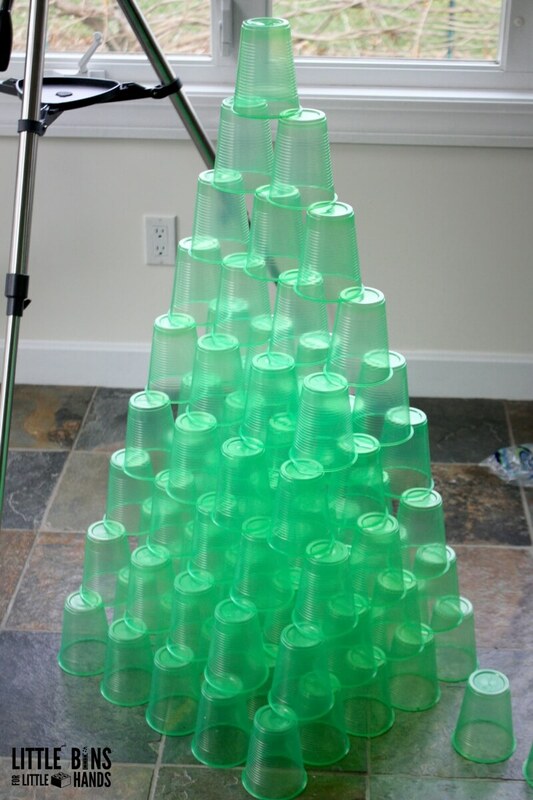 Challenge your kids to build a Christmas tree with 100 cups. 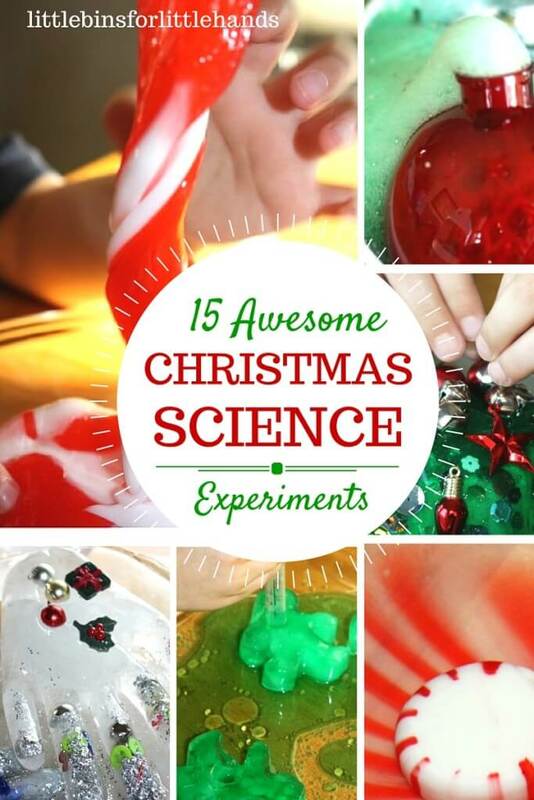 It’s a great way to combine easy science experiments for kids with a ton of holiday and Christmas fun as well! Finding the perfect experiments for kids doesn’t have to be hard! Cups, cups, and lots of cups! 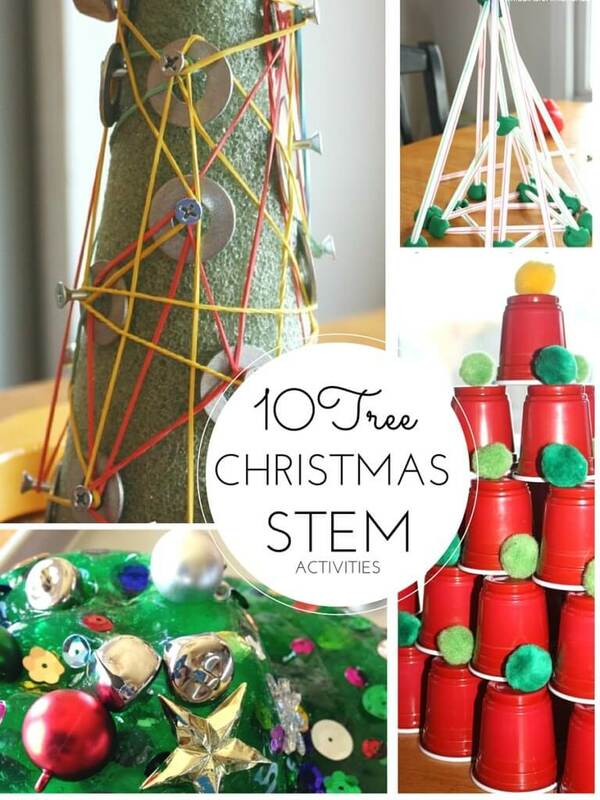 That’s all you need to get started with this Christmas tree STEM Challenge. 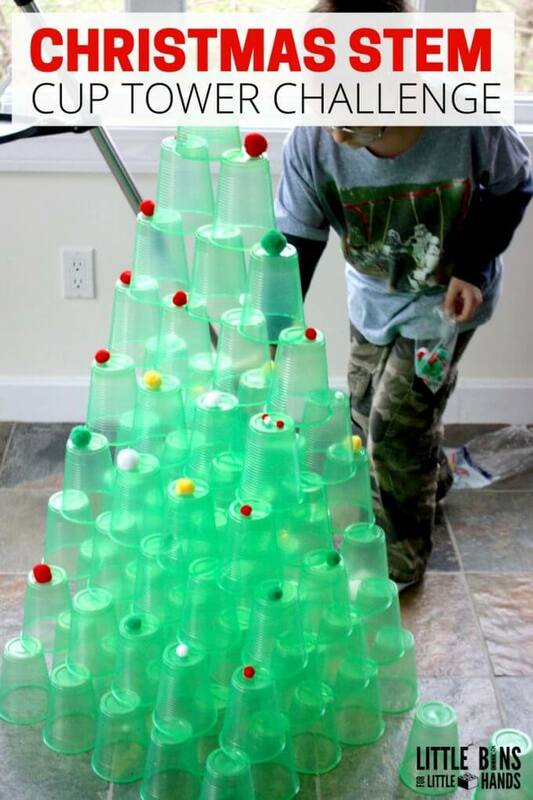 Challenge your kids to use as many of the cups as they can to build their own Christmas tree. And…. 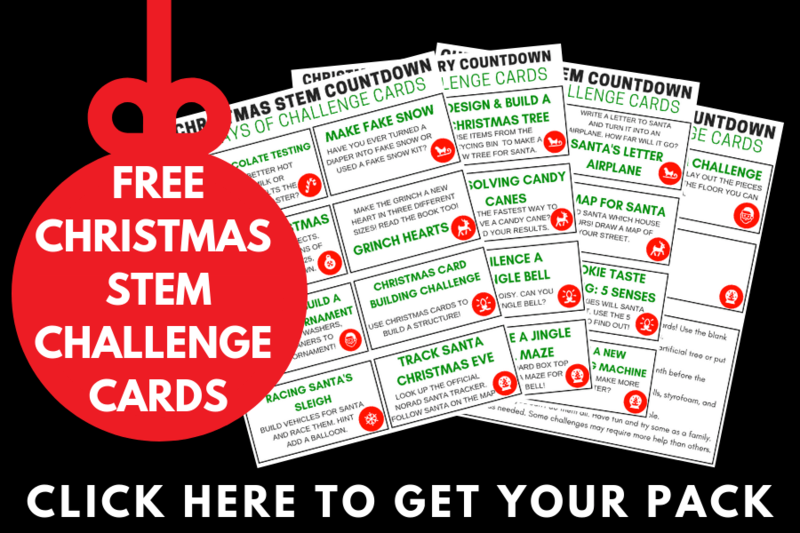 if you need more Christmas Tree STEM challenges, check these out. STEM Challenges with Christmas themes makes holiday learning and play extra interesting! Finding fun science experiments for kids is seriously so much fun! 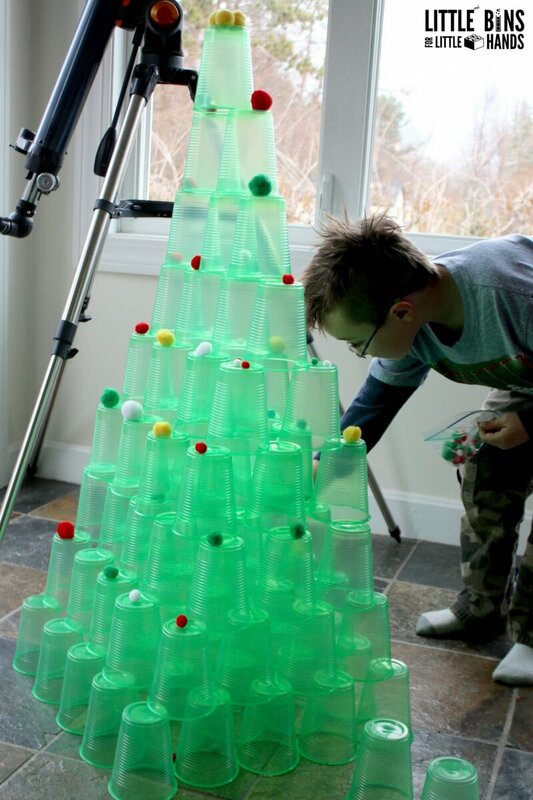 Decorate your Christmas STEM challenge and cup tower with pompoms or even crumpled tissue paper for Christmas tree decorations. 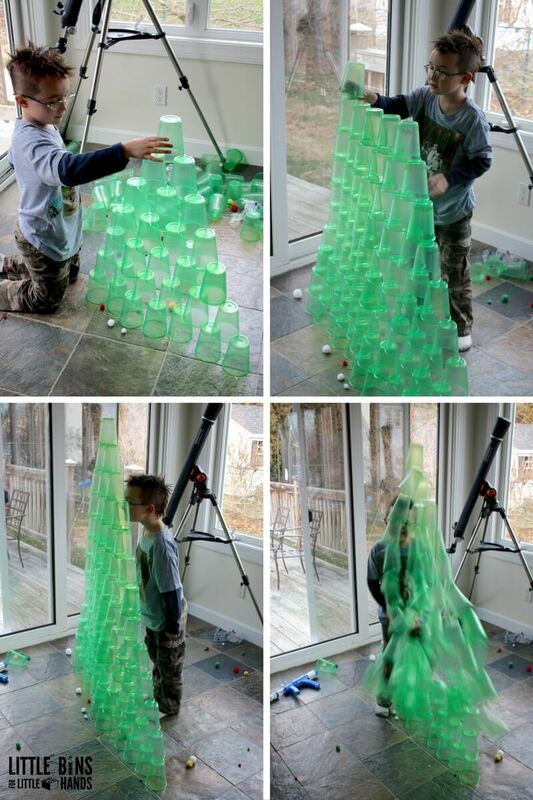 STEM Challenges are a great way to get your kids thinking and doing even with simple supplies like these plastic party cups. We have a whole list of STEM Supplies On A Budget to check out. 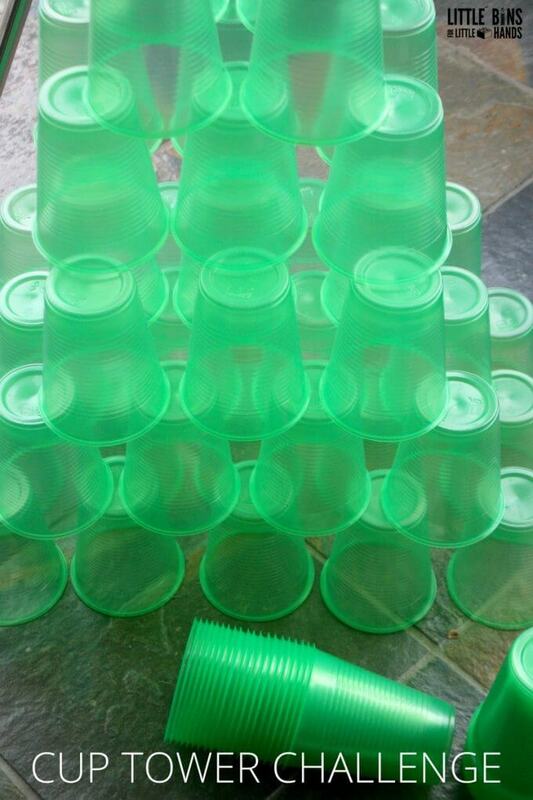 There’s nothing better than building a huge cup tower Christmas tree and then knocking it down! Your kids will love this fun and addictive kids science experiment! 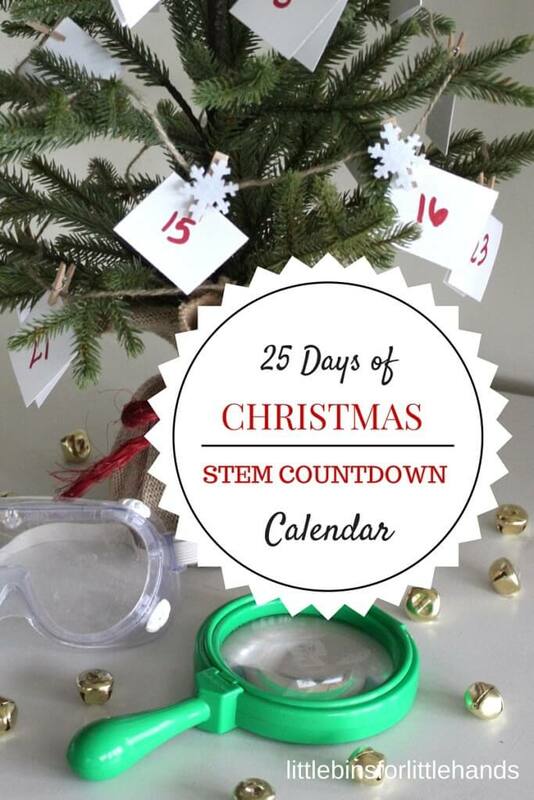 A simple and fun Christmas STEM activity for any time any day that all the kids can enjoy together. Go screen free your next indoor or stuck inside day. The kids will have a blast. If you have nerf guns, snowball shooters, or even rolled up socks, use them too for knocking down the towers. You can’t go wrong with fun ideas with this science experiment for kids! Click on the photos below for more fun Christmas STEM activities. I love this idea! What a great way to encourage cooperation, creative thinking, and patience. This will be so much fun to do! I bought mine in the grocery store but I have seen them at the dollar store too.